안녕하세요, 하버드 Rowe Lab에서 한글과 영어를 하는 3-5세 bilingual 아이들과 함께하는 언어발달 연구를 진행중이니 많은 참여 부탁드립니다! 아이와 함께 하버드 캠브릿지 캠퍼스에 있는 저희 연구실에 오셔서 아이와 함께 재미있는 게임을 하고 설문지를 작성해주시면 되는 간단한 연구입니다.^^ 연구가 진행되는 동안 근처 주차장에 무료로 주차를 하실 수 있고, 게임 후에는 아이들을 위한 작은 선물도 준비되어 있습니다! 많은 가족분들께서 참여해주셨습니다. 이제 연구가 거의 마무리 단계에 접어들었으니 더욱 더 많은 관심 부탁드립니다 :) 아이와 함께 할 재미있는 활동을 찾고 계시는 부모님과 이 연구에 대해서 더 알고싶으신 부모님께서는 rowelab@gse.harvard.edu로 이메일 주시거나 www.meredith-rowe.com/lab/#contact-form로 들어가셔서 Bilingual Child Study 참여 신청해주세요! 감사합니다. The Rowe Lab at the Harvard Graduate School of Education (check out our lab page: www.meredith-rowe.com/lab) is running a fun study on young bilingual children's language development. 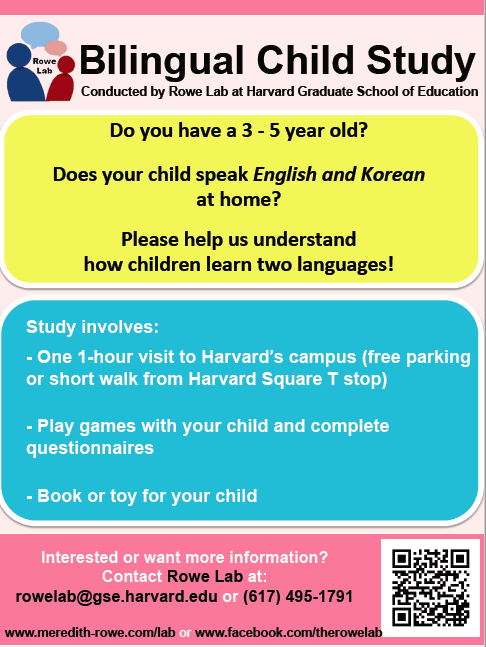 We'd love to invite families with 3 to 5 year olds who speak English and Korean to participate in our research study. We ask you to visit our lab once and play fun games and complete questionnaires. Our lab, located at 20 University Road in Cambridge, is right in the heart of Harvard Square, so it will be fun to explore the area after the visit. We provide free parking in a covered garage and toy/book for children at the end of the visit. If you are looking to go on a special outing and would like to hear more about our study, please visit www.meredith-rowe.com/lab/#contact-form, or contact us at rowelab@gse.harvard.edu. We look forward to hearing from you!